Tesla Motors is to begin offering Chinese buyers the chance to trade in their own vehicles for Model S electric cars, worth more than $100,000 each. The plan is part of the company’s strategy to boost sales in the world’s biggest car market. Billionaire Elon Musk, CEO of Tesla Motors, said the company will liaise with used-car traders to buy vehicles from customers in Beijing, Shanghai, and Hangzhou, according to Bloomberg News. The program applies to all car brands and types – gasoline, diesel, and electric cars – but won’t apply to second-hand Model S owners. The company will deduct the value of the sale from the price of the luxury electric car, which starts from 648,000 yuan (US$104,000) in China. Tesla also said it would install charging facilities for consumers using the trade-in service, free of charge. The company is not the first one to come up with such a deal; BMW and Audi are already offering trade-in services in China to boost sales. “But it is surprising that Tesla has launched such service. It will draw more attention for Tesla,” Wu Shuocheng, a senior analyst at Menutor Consulting Shanghai Co, told the Global Times. Tesla started delivering Model S sedans in China in April, and since then the company has sold 3,431 electric cars there, according to aastocks.com. Musk has said he expects to start building the cars in China within three to four years, and estimates are that the Chinese market will contribute 35 percent of the company’s global sales, or 10,000 cars a year. Some 18 million cars were sold in China last year, but only 38,000 were new energy cars. 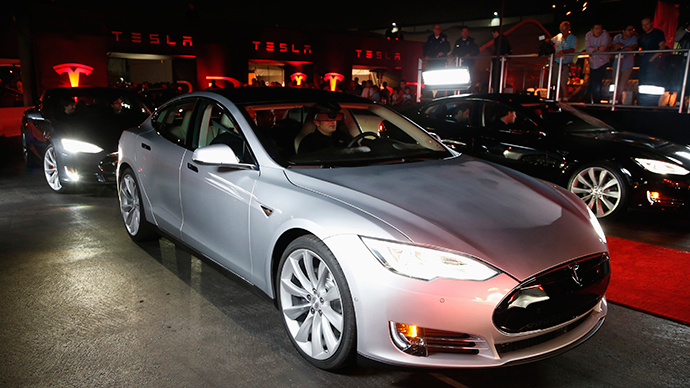 READ MORE:US biggest electric car maker Tesla gives away its patents – but why? According to Chinese law, the government enforces a 50 percent foreign ownership cap, requiring cooperation with local producers in order to build cars in China. The Palo Alto, California-based carmaker has nine stores and service centers in six Chinese cities, and has been working with two Chinese companies to build charging stations in the country. It has 700 power points in 70 cities across China, making it the market with the biggest network after the US, Tesla said.